With the right Halloween angel makeup, you can look like a sweet and innocent angel or a spooky dark angel. 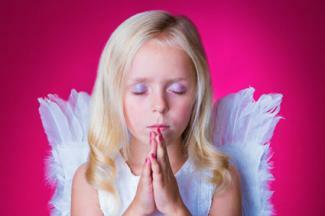 Angels are a popular Halloween idea costume for girls of all ages, including teens and women. Evoking sweetness and innocence, the angel is a costume that is fun, appropriate for any age, and is simple to pull off. Girls might also want to use face glitter or experiment with face paint to create fun, ethereal-looking angel designs near the eyes. Teen girls and women might want to add a little more to their angel makeup look, but should still keep the look light and fresh. For a flawless canvas, start with a facial foundation. For teen girls or women whose skin is in great condition, a tinted moisturizer might be all that is needed. If you need a little more coverage, crème-to-powder foundation or mineral foundation will provide good coverage and still create a dewy, youthful look. Create an ethereal, natural angel eye look by dusting a light-colored eye shadow in a pearl, shimmer, or glitter formula on the lid of the eye. You can apply this light shade all the way up to the brow bone, and apply a tiny bit on the inner corner of the eye for added brightness. To bring out the eyes and keep them from looking washed out or hidden in the eye shadow, apply a medium shade in a color such as light purple, blue, or grey in the crease. You can also use eye liner along the top lid using a similar color of eyeliner. You can also use glitter or shimmer eye shadow pigments if you want a more high-impact eye look. One way to create an angel-inspired look is the apply a the eye shadow on the entire eyelid, then 'wing' out the shadow with a small swirl or swoop at the outer corner of the eye. For a wide-eyed, innocent angel look, long lashes are a must. Curl the eye lashes and use several coats of soft black or black-brown mascara for a natural look. For a fantasy look, use colored mascara, or apply artistic false eyelashes (available at many online beauty supply stores) with feather or other unique tips. Choose a blush color that complements your skin tone. Great options for an angel look include pink, peach, or rose tones. A gel or crème blush will help create a soft, fresh appearance in keeping with your angel ensemble, but powder blush can also work well. A shimmer or clear lip gloss works well for any angel makeup look, but you can also choose pearlized lipstick shades in pink, peach, mauve, rose, or cherry. If you are going with a high-impact eye, are using fantasy lashes, or creating artistic designs near the eye, be sure to keep the lip soft. If you are not going all out with your eye makeup, however, you can create a more dramatic lip look that is still in keeping with the costume. Consider a super-shine or high glitter lipstick, create a pretty Cupid's bow pout with cherry red lipstick and liner, or use an unusual lip color such as white, silver, or gold. Although a dark angel costume isn't one most parents allow for young girls, it is a fun and mysterious look for teens and women. 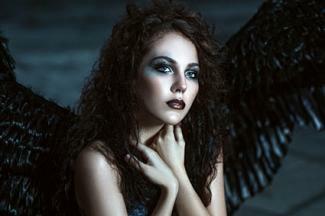 If you want the look, all the steps are in our article on dark or fallen angel makeup. Whether you choose a simple pink lip gloss and blush, go all out with glitter and eye designs, or choose a darker look, it's easy and fun to create the perfect Halloween angel makeup.